The great purple hairstreak (Atlides halesus) is a very distinctive looking butterfly – however, it is not purple. Since both the upper and lower sides of the wings are blackish with widespread iridescent blue coloring, perhaps another common name, great blue hairstreak, is more appropriate. Perhaps someone at some point thought the black wings in a certain light looked purple? Hairtails get their common name from thin hair-like tails (one short and one long) on the hind wings. The abdomen of the great purple hairstreak is bluish on the top and red-orange beneath. There are three orange spots near the abdomen. and iridescent gold markings (they often appear more white than gold) near the tails. The gold iridescence may resemble a head and cause a predator to grab the wings at the back of the body allowing the great purple hairstreak to escape when the wing tears. Many purple hairstreaks are seen missing part of the hind wings. Great purple hairstreaks are found from Guatamala north into California, east through Texas and Southern Missouri and into Maryland. Their preferred habitats are rural and suburban woodlands infested with mistletoe belonging to the genus Phoradendron, species of which infect oaks and other broadleaf trees and junipers. Great purple hairstreak caterpillars (larvae) feed on mistletoe. Adults emerge in the early spring after overwintering in the pupal stage in crevices at the base of or under the bark of host trees. Adults eat flower nectar. 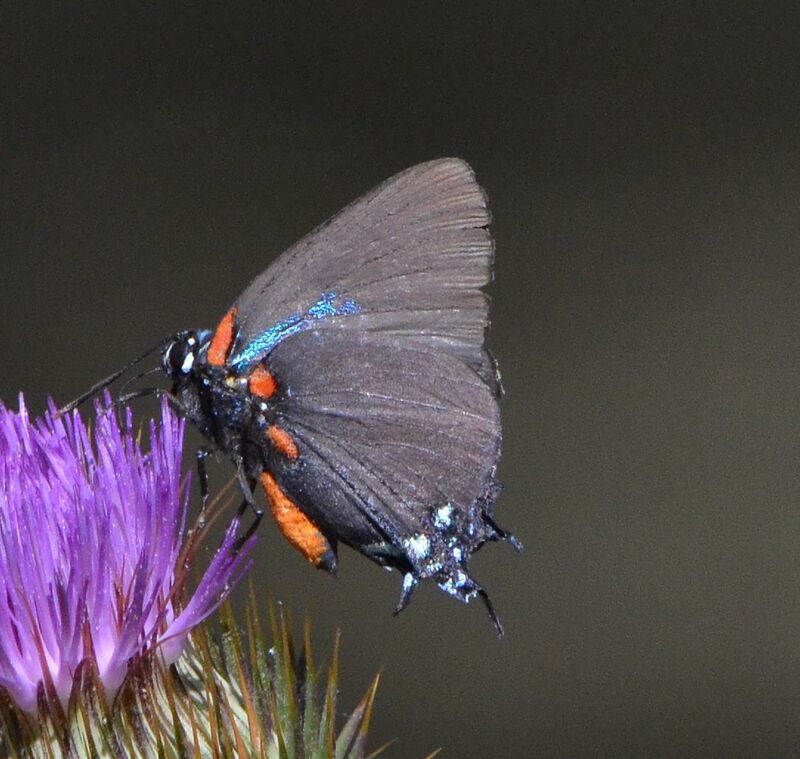 This great purple hairstreak was one of many sipping nectar in the Dan Ryan Meadow along Ash Creek (Lassen County CA). This entry was posted in Insects and tagged Atlides halesus, great blue hairstreak, great purple hairstreak, nature photography, Phoradendron. Bookmark the permalink. BEAUTIFUL…you know how I love butterflies !!! I particularly like this butterfly – at first glance it looks like a “plain little brown butterfly” and only on closer inspection does its true beauty reveal itself. Love your post, information and photographs. Chris!! !